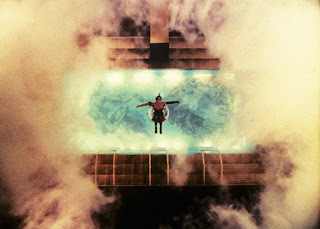 Tim Curry, as well see Resonating Aquarius in a pool beneath a Tower at the end of the Aquarian Age milemarker " The Rocky Horror Picture Show"
Aquarius! 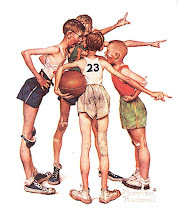 The approaching Astrological Age, Typified by Self Determination, Equality, Humanism, Science, Androgyny, Synchronicity, Change, uncontrollable energy. Symbolized by 2 wavy Lines (Kundalini/Electricity Life Force). 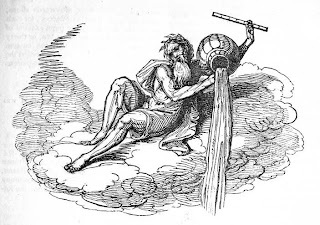 Aquarius is symbolized by Electric Wavy Lines, and is also an Air Sign, which means it strongly Resonates with the Intellect, The Tarot Elemental Suit of Swords, Communication, Analyzation, Synthesis and Division, Consciousness, Concepts, Language, etc. 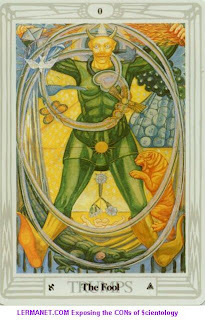 The Fool Tarot Trump 0 is attributed the Element of Air, thus the free flowing, eccentricity, liberated, and immaterial nature of the card. We can Note the Rainbow behind him, and Id also like to add that This card symbolizes the Androgynous nature of Consciousness, Crowley Wrote something like " be both Male and Female, Babe in the Egg of Blue" in his book of Thoth. 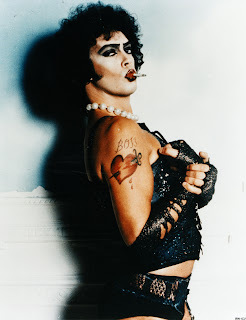 Androgyny is going to be the focus of this post. 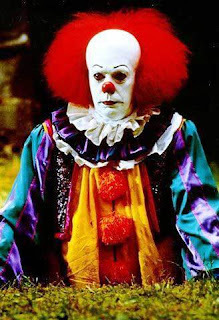 We can see Tim Curry Resonating the airy Fool card as the Clown "Pennywise" in Stephen Kings "IT" or is it spirIT. Clowns resonating with The Fool or the Joker or Madman titles also given to the card. Tim Currys first role in film was as "The Madman in the Dutchess of Malfi". 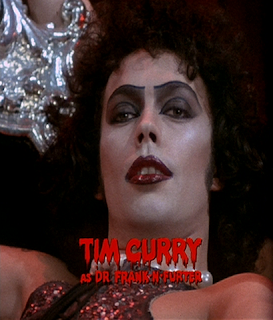 Tim Curry with his face painted White in Rocky Horror as Doctor(Alchemist) Frank N Furter, resonating with the Joker/Fool/IT role. He claims to have found the Secret to Life in his Lab at his Mansion, and as it happens A young and uptight couple need to stop at his mansion during a storm. What I interepret this movie as is a moving heiroglyph demonstrating the transition of Pisces into Aquarius using the Male and Female Rigid Gender Archetypes of the 50s and transforming them into the Androgynous Aquarian couple of the 60s-70s. The film starts with a traditional Christian Piscean Wedding between Brad and Jane(Boaz and Joachim?). And by the time these two leave Furters castle they are sexually and culturally liberated and Alchemically Transformed. The Alchemist Furter preparing to create the New Man, Rocky Horror, note the Red Triangle facing up Symbolizing fire and resonating with Alchemy. His character resonates with Aleister Crowley, Timothy Leary, Charles Manson, and many other eccentric cats who had somewhat of their own Cult-ures. Note the Tatoo on Furters Arm A Sword resonating the Tarot Suit of Swords which is the Element Air-Intellect, now this also resonates to me the Tin Man who represents Intellect and the search for the Heart. 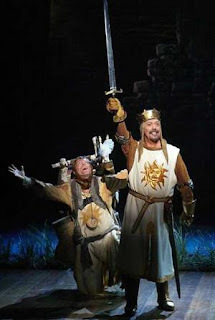 Well see Tim Curry and swords again. 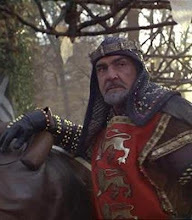 The Lightning/Wavy line action in this film and the Sword also make me think of the Kabbalistic Sword of Lightning Mentioned in my previous post Rock and Runes. 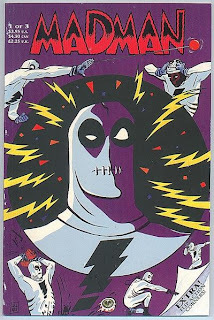 Tim Currys first role was Madman, I looked it up but really only got this random comic called Madman featuring lightning bolts. 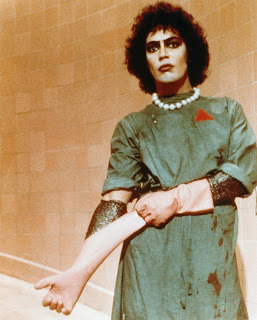 The Rainbow Rebis Ressurection of Rocky Horror. Ressurection confirmed by his mummy like emergence from the Aquarian Rainbow Stargate. 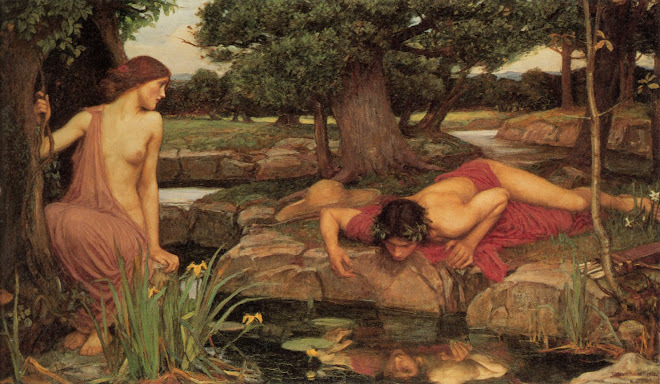 The Alchemical Conjunctio the union of the Male and Female, the creation of the Rebis the Divine Androyne. I actually dont remember the end very well, but I do beleive that Furter is turned on by his two Alien friends, who planned to leave planet Earth without Rocky. 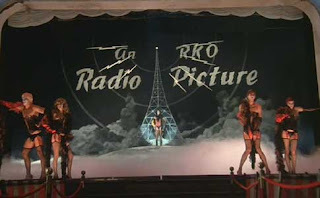 Anyways in the end he falls into a Giant pool of water and an Electric Sig radio tower that I beleive falls into the Pool with Rocky. Sorry I cant remember the plot but I was hoping to just draw attention to the use of the Rainbow and the Bolt in this transitional film. The Placement of the Huge Antahkarana Resonant Radio Tower an Bolts of En-Lightning-ment soon after a Rainbow Ressurction box interests me, I need to borrow this from someone as ive found nowhere to watch it on the Net. Furters two helpers who happen to be from another planet and planned to use Furters house for a good time also have the Lightning Bolt on their Shirts, in this film they could turn people into statues with their Lightning Bolt Gun. Note the Horns on the Pan resonant Fool Cards characters Head. 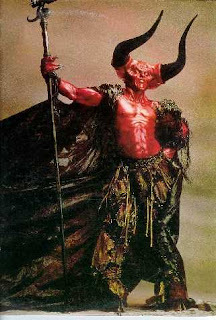 Tim Curry is also the Lord of Darkness in Legend, featuring horned Pan resonance. My daughter brought this home from the library the other day. You may find it interesting: The Worst Witch. I didn't watch it. Too busy reading The Lost Symbol. You may find the film of use.